Lawyer, judge, public servant, trailblazer: these are only a few words to describe the remarkable accomplishments of the Honorable Marvin S. Arrington, Sr., of Atlanta, Georgia. This autobiography is a testament to what happens when childhood lessons, hard work, and perseverance meet determination and optimism. It’s the story of a dedicated man, born in to the segregated South who went on to break down racial barriers and build walls of inclusion and harmony. Judge Arrington was the first African American to become partner at an all-white Atlanta law firm and then, later, established one of the largest and most successful minority law firms in the country. 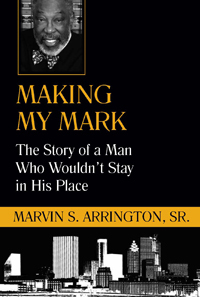 In 1969, through his own courage, vision, and determination, Arrington became the youngest person ever elected to the Atlanta Board of Aldermen, which later became the Atlanta City Council. During Judge Arrington’s nearly thirty-year tenure on the Atlanta City Council, he served as city council president numerous times and remained fiercely devoted to being a voice for the voiceless: the elderly, the disadvantaged, the homeless, and others. He changed the landscape of Atlanta. Today, Marvin Arrington is a distinguished judge on the Fulton County Superior Court who continues now to address the great challenges of the 21st century.. In his seventh decade, Arrington continues to mentor, educate, and inspire future generations. Judge Arrington credits his life to God’s grace and mercy, and to his loving parents and supportive family and friends.